Jorge Ortega, Ewín Sholá is a priest of Obatalá who resides in Miami. Ewín Sholá was ordained to Obatalá as a teenager by Conrado García, Odurosinmí, during the early repressive days of the Cuban revolution when ordaining minors was forbidden. Anyone caught doing so would face imprisonment and have their orishas confiscated and destroyed. 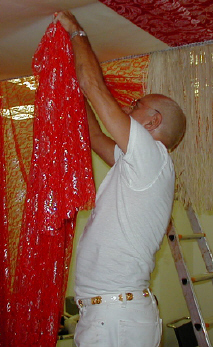 Ewín Sholá arrived to the U.S. via the 1980 Mariel boatlift and soon after, began manufacturing orisha garments and panels, and installing thrones for his Babalorisha, and eventually for the community. Currently Ewín Sholá specializes in orisha garments, panels and thrones. His work is among the most coveted in Miami for its beauty and grace, combining tradition with innovation and gusto. Much of Ewín Sholá’s work appears throughout the pages of Eleda.Org, including the throne for Shangó on the website’s home page. He was also one of the artists featured in Miami’s “At the Crossroads. . .” exhibit in 2000. 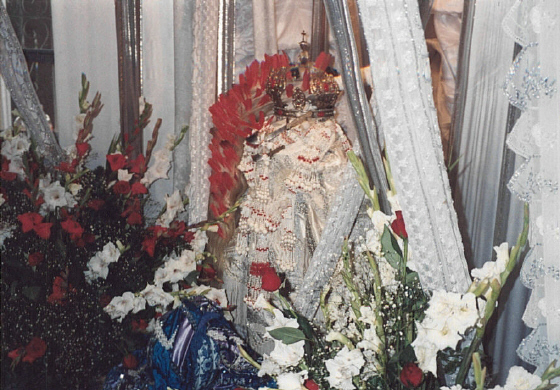 Norberto Fernández, better known as “El Nene,” has been installing Orisha thrones since the 1960s. He was ordained in Cuba to Yemojá, in 1958 by Armando García, Shangó Dina, a very well known Obá Oriaté, who also eventually migrated to the U.S. El Nene was one of the pioneer throne makers in the U.S., and possibly the first to actually begin installing thrones as a specific function within the religious realm. Though he had installed many thrones in Cuba since the 1960s, he did so for his friends and religious relatives, but he was not considered a throne maker per se. He simply had the creativity to express himself in an aesthetically pleasing manner. Soon after his arrival, Nene says, Yemojá told him in divination that he had to “work” the religion (i.e. function in some religious capacity). Nene says that he asked Yemojá for the liberty to choose the area that he would like to function in and she agreed to his request. This is how it all began. Nene gave birth to a new field in the religious world of the Lukumí that would eventually spread as others began following in his footsteps. Nene’s craft is a true demonstration of syncretism at its highest peak. 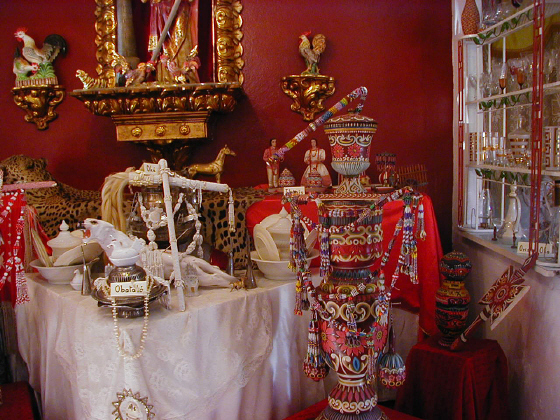 Western materials and embroidered panels, Oriental jars, European beads strung in African-influenced patterns, and a number of other elements, recreate a non-Western religious ideology and cosmos, in an elaborate installation used for ordinations, celebrations, and ceremonies, usually open to the public. Lukumí thrones are a true marvel for they accentuate the beauty and finesse of the orishas and the expressivity of the artist in ways that gratify both Divine and mundane exigencies. Nene’s work, although religious in nature, is also one of the best examples of the richness, diversity, and adaptative nature of Lukumí/Yoruba religion, something that facilitates its growth as it continues to spread to different areas of the world. Nene’s work has been featured in various museum exhibitions, most notably two exhibits in Miami, “Caribbean Percussion Traditions,” and “At the Crossroads: Afro-Cuban Orisha Arts in Miami,” both at the Florida Historical Museum in Miami. Most recently, a throne installed by Nene is at the Museum Kunst Pallast in Dusseldorf, Germany, as part of the “Altars of the World” exhibit which will travel through Europe in the coming years. The evolution of Lukumi Orisha religion in Miami has impacted the creative process of the thrones and the artists that produce these textile microcosms. Materials from different parts of the world are permanent components in the installation of a Lukumi throne. The artists creating these thrones are able to express their art form in more elaborate and creative manners than their Cuban predecessors due to the mass availability of textiles and other materials as well as the demand from patrons of more unique, often sensational designs. The artist or designer is in charge of displaying the colors, materials, objects or attributes, and any other references appropriate for the specific deity for whom the throne is built. The Lukumi build three types of thrones which are identified according to the ritual for which they are intended: the consecration (ordination or initiation) throne, the observance throne, and the ritual throne. 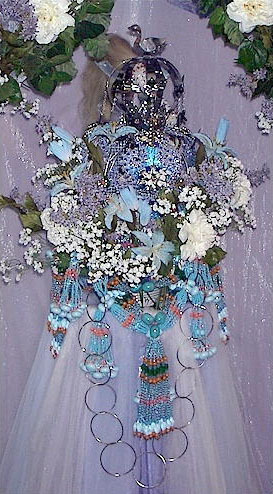 The consecration throne is representative of the orisha that the person is going to be ordained to. This throne is created for the sole purpose of this most important ceremony, a rite that can only happen once in the olorisha’s life. 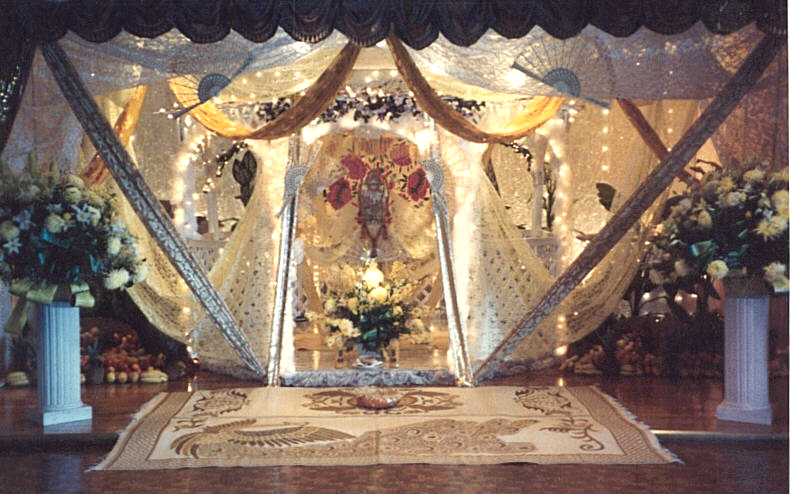 The iyawo (newly ordained priest/ess), re-born into a new life, is confined under this throne for the seven days of the ordination ritual and in most ways attended to as if he or she were a newborn child. 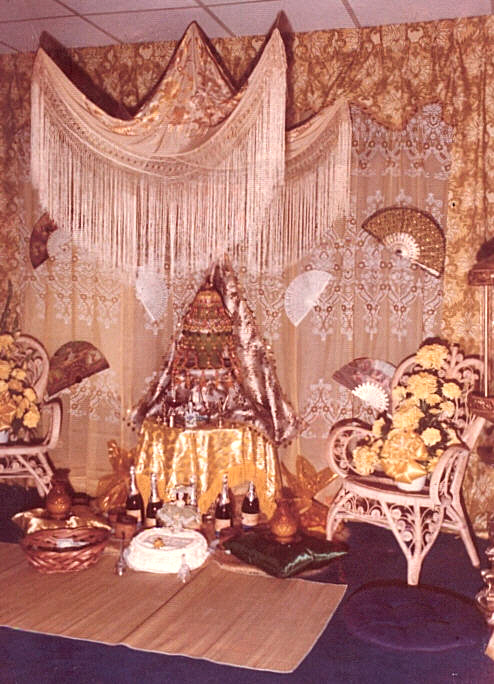 The observance throne is typically constructed once a year to celebrate the anniversary of an olorisha’s ordination. In this case, the throne is built for the deities, not for the olorisha. 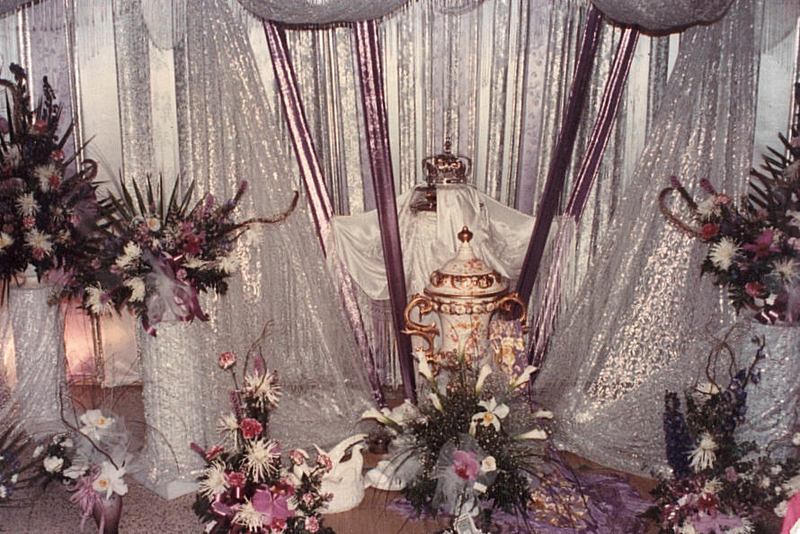 This type of throne tends to be more elaborate than the ordination throne because it is part of the celebration of the ordained person’s “birth” in the Orisha religion. The artist has more freedom to display materials, colors, artifacts, and most importantly, the orishas who are placed in the throne and exalted with their ritual paraphernalia and decor. 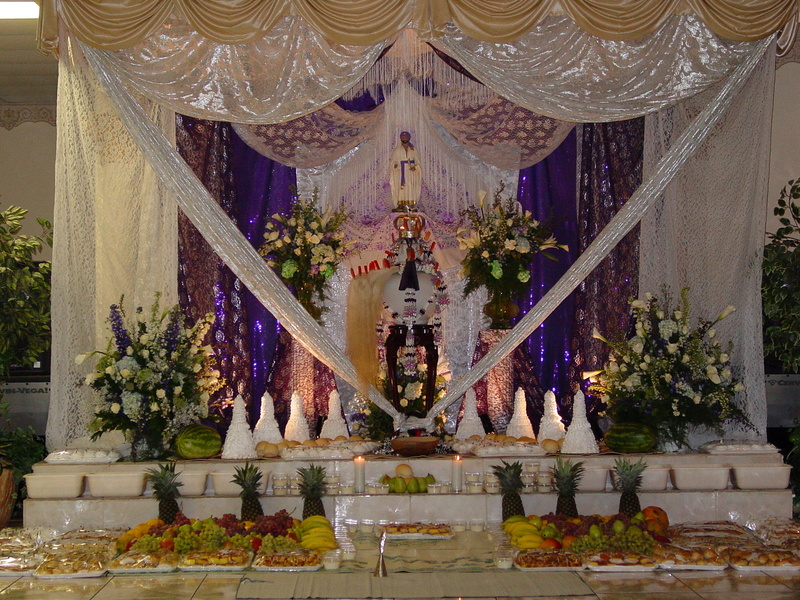 In the observance throne there is a hierarchy in which the orishas should be placed. 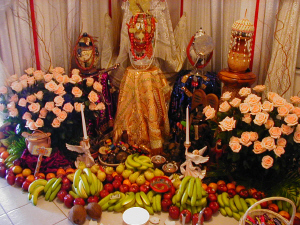 Various orishas are consecrated for the iyawo in the ordination ritual: at minimum Elegba, Obatala, Oshun, Shango and Yemoja. 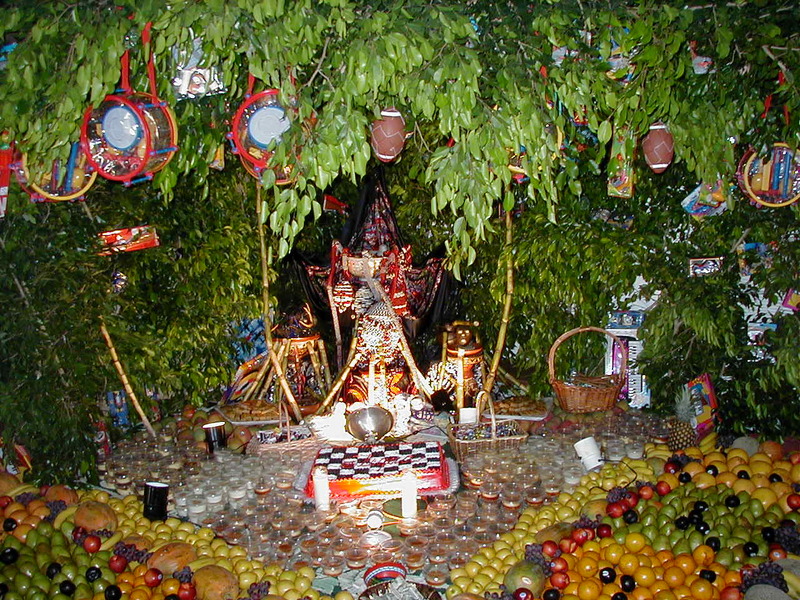 The olorisha’s tutelar deity is considered the “mother” or “father” orisha and an accompanying orisha is identified during the rituals as the “second parent” or deity. 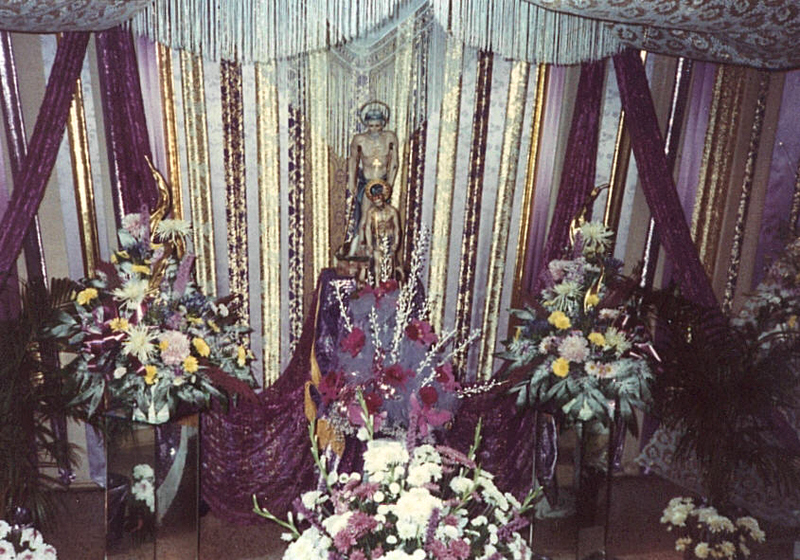 When an observance throne is built, all the orishas consecrated during the ordination must be placed in the throne in specific positions defined by hierachy. The highest level is reserved for Obatala, the most senior deity and father of all the orishas. Next in importance is the olorisha’s tutelar deity, usually placed in the center, immediately below and before Obatala. 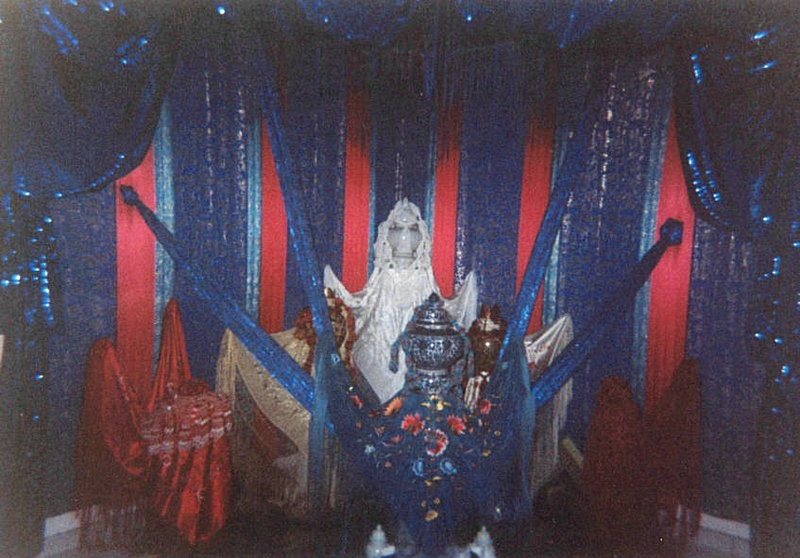 Were Obatala the tutelar orisha, the devotee’s second orisha, would be placed in front. Finally, the remaining orishas will be arranged on the right and left sides of the throne, following less stricter guidelines. 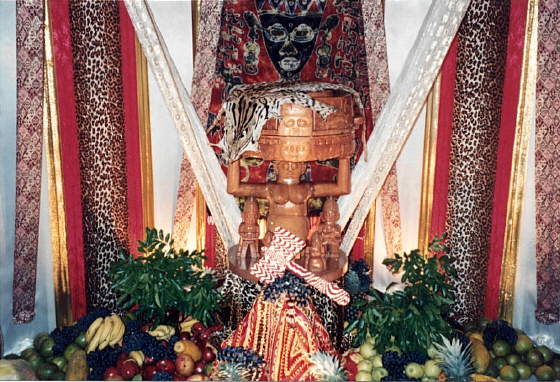 The ritual throne is erected for any orisha. The ritual throne is built for specific occasions that arise as need prevails or as determined in divination. 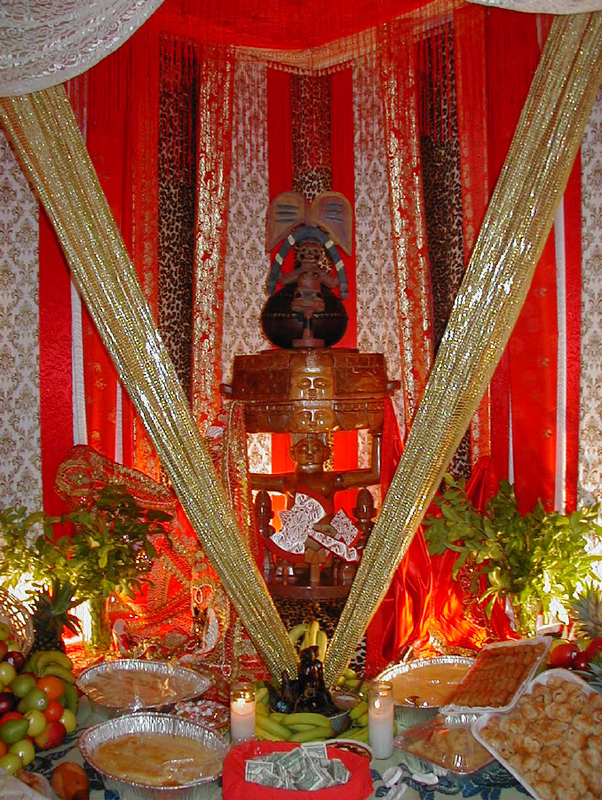 When an olorisha consults the oracles and these recommend specific ceremonies such as wemileres (drum feasts) or other types of celebrations, a throne is usually required. 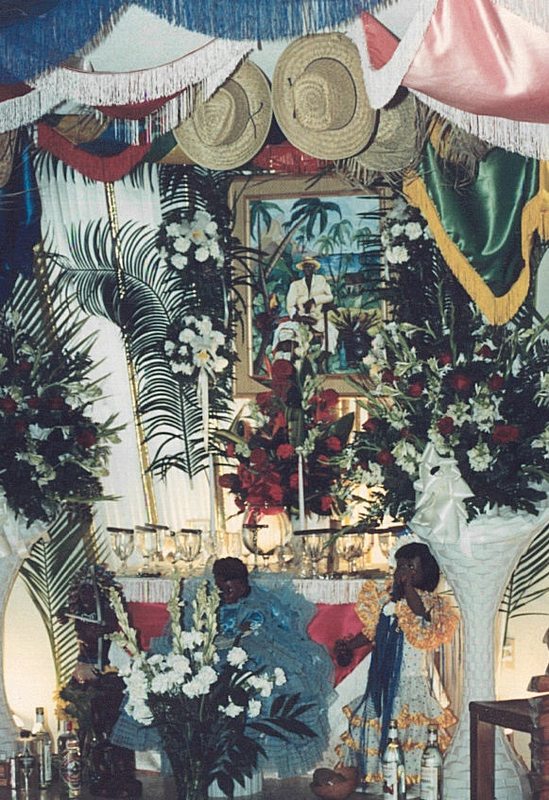 This throne is specifically erected for the ceremony and exclusively for the orisha who requested the celebration. This throne is also often more ornate than the ordination throne and its artistic beauty can be appreciated much better than in an observance throne because typically only one orisha is highlighted. 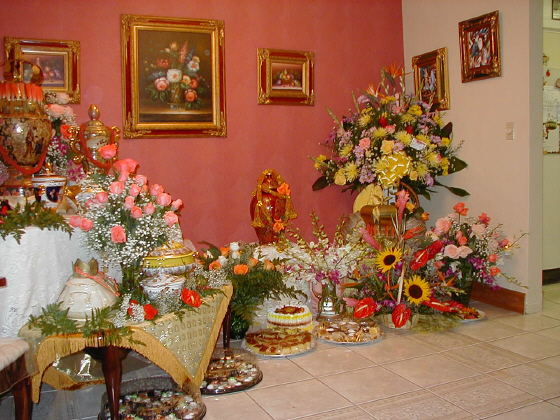 In terms of openness, there is more to see and the thronemaker tends to play with the available materials to mesmerize the devotees who will come to pay homage. 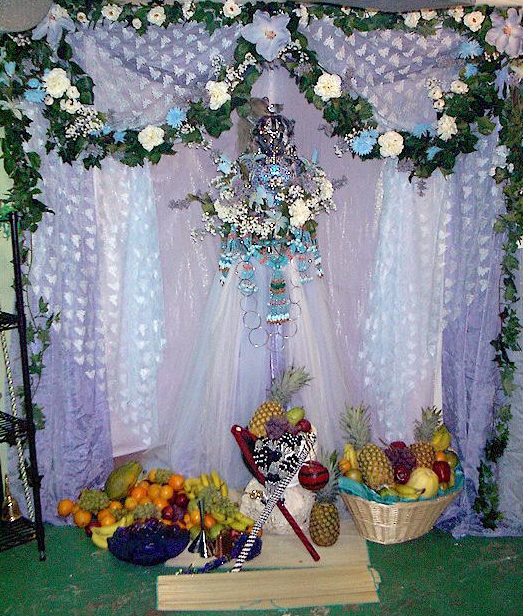 In both the observance and ritual thrones, a variety of fruits, pastries, puddings, breads, and other offerings are placed before the orishas. Once the ritual has concluded, these items are distributed to everyone who attend the ritual. These foods are considered sacred. They have ashe-the divine energy of Olodumare and the orishas. To consume these foods is to commune with the deities and thereby ingest their revitalizing energy.